Ask fellow campers about "Driftwood Provincial Park" and nearby attractions. Lovely park just off the highway. Had a pull through site 75. Great privacy for a pull through. Nice trails to hike. 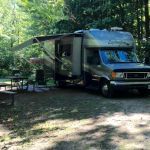 We camped at Driftwood Provincial Park in a Fifth Wheel. This Provincial Park was disappointing for me but has the potential to be very good. The best sites in the park are at the lower level along the river. Most aren't big enough for 5th wheels and motor homes and none have electricity. The sites higher up have virtually no view of the river and are way overgrown. These have electricity but the electric posts are so far away from the site that an extension is need. I rented one from the park and it and my regular cord just barely reached the post. Many of the pull-throughs are among the most unlevel sites anyone could imagine and the tree limb growth scrapes the top of any rig taller than 10 feet. There is no Wi-Fi, no store or no services other than firewood. If you have a tent, a pop-up, a B-van or a small camper, getting a site on the water may be rewarding for you as the views are nice. To be a really good park, much tree work is needed, the electric posts need to be moved closer to the site, the pull-throughs leveled and maybe 25% of sites along the water having electricity would be the steps to take. We camped at Driftwood Provincial Park in a Motorhome. Easy access off hwy. Great entrance. Friendly park staff. Two comments that rate it an "8". Sites are too overgrown for a 45'. It would be great for big rigs if they would trim trees both on the side and overhead in the sites. Also the AC voltage was to low so we did hook up. If you do stay here, walk down to the river. The view is spectacular at sunset! We camped at Driftwood Provincial Park in a Motorhome. Are you affiliated with Driftwood Provincial Park ?